This is Part II of our case study about helping a dog after a loss (see August 24th blog for Part I). As usual, many of you came up with insightful and helpful comments. I benefit from your thoughtfulness every day, and I thank you for it. If you are interested in this topic, either personally or professionally, I encourage you to read the first post about Dogs Grieving as well as the comments. 1. ACCEPTANCE. Easiest to say, hardest to do. By “acceptance” I mean accepting that you couldn’t prevent the death or disappearance of another, and that you can’t ‘fix’ the pain that your living dog may be going through. If your dog is truly grieving (and I think some do, more on that later), it helps greatly to understand that you can’t really ‘fix’ it, anymore than someone else can make your pain go away when you are grieving. Yes, others can help ease the pain, and soothe and support, but no one can do what the griever wants–which is getting their friend back. What does help many of us is acknowledgement that the pain is there, and I suspect that might also be true of dogs. I realize that some do not agree, but my experiences suggest that some dogs really do grieve a loss in ways similar to humans, and perhaps finding some way to acknowledge that, without trying to ‘fix’ it might be helpful. Now I suspect that some of you really are going to think I’m crazy, but one way to acknowledge it is to talk about it. Will your dog understand what you are saying? Nope, not in the sense that a person would, but just saying the words has an impact on your behavior and emotions and perhaps that has an impact of our dogs. I’ve heard many stories of dogs changing their behavior after someone sat down with them and said “Chief is gone and won’t be coming back. I am very sad about it and I think you may be too.” I know, I know, I can see folks shaking their heads, but I don’t think it matters that much that your dog understands the words, or even the concept of death. There’s just something about giving voice to an emotion that, just perhaps, might help a dog sort out his or her own confusion over what’s happening. 2. ALLOW YOURSELF TO GRIEVE: I agree wholeheartedly with many of the comments that if you are sad your dog will know it, and I don’t think it’s good to try to hide your grief from your dog. That said, I did ask Cin about how much she’d been crying around Sleeve, because I’ve had clients whose dogs appeared to be overwhelmed with their owner’s grief. This is a very tricky line to walk… not trying to hide your own sadness around your dog, but being aware that, perhaps like children, dogs can be extremely sensitive to your suffering and feel powerless to ‘fix’ it themselves. For myself, for what it’s worth, I’ve found that for the first few days after losing a dog I am not capable of taking care of much of anything. I’ll spend time alone, time with closest friends and time with my remaining dogs, usually very quiet and in a kind of a shock. I think dogs need something similar to what we need, gentleness, caring concern and time time time. 3. STICK WITH ROUTINE OR CHANGE IT UP? I suspect that time is the answer to the question of which is better, “Keep things the same,” or “do new things”? Reader’s comments from last week, as one of you so observantly noted, were about equally split between “keep up the usual routine” and “add new things into your dog’s repertoire.” Early on (the definition of which is, of course, extremely variable depending on the dog), I think it’s important to keep things the same as much as you can. Perhaps for the first 3 days, or 3 weeks…? Let your dog grieve, be kind and gentle and as “there” for your dog as you are capable of. However, at some point I’ve found it very helpful to create new routines. Do things with your dog that aren’t triggers for “But where’s Chief?” Surely every context and activity that used to include the deceased dog is a reminder that he or she isn’t there anymore. So I’ve advised clients to take walks in new places (if the dog enjoys them), teach new tricks, perhaps meet new doggy friends if that is something your dog might enjoy. I always like to add Nose Work in for any needy dog, given that it’s the nose that defines a dog’s understanding of the world, and their way of finding their place in it. Many dogs seemed to be thrilled that we have caught on to their ability and want to play too, or at least that we are giving them a chance. And it’s something you can do with dogs of any age, even if they are geriatric and slow moving. I make this recommendation in the belief that it’s important to be aware how powerful classical conditioning is, and how our emotions & expectations can be influenced by environments and actions. I remember flying for the first time after my father had died. It had been many months, closer to a year, and I frankly hadn’t thought about him in quite awhile. And then I got on the plane and began to cry, because every time I’d ever been on a plane my father had been alive. Flying had nothing to do with him directly: I didn’t fly with him or associate him with planes in any way. It was just the confluence of two events that hit my emotional brain like a rock. These systems are profoundly primitive, and there’s every reason to believe they function in dogs in similar ways to the way they function in us. 4. EXPECT ANYTHING OR EVERYTHING. I’ve seen dogs react to the death of others in just about every way possible. Lassie sniffed Mist’s body and walked away as if she’d sniffed an old shoe. But when Tulip died, she paced around her body in circles, finally lying down beside Tulip with her head on the ground. Lassie’s father, Luke, paid no attention to another dog’s death at all. When I finally encouraged him to sniff the body of Misty, he snorted and startled backward like a frightened horse. I’ve seen and heard about dogs who seemed to pay no attention to either the absence of a dog or its body. I’ve seen and heard about dogs who reacted by not eating for days, sometimes weeks. There are a few things to keep in mind here: a) just because a dog doesn’t visibly react doesn’t mean we know they are not ‘reacting’ emotionally and b) not only is every dog different, but his or her relationship to any other dog varies greatly. Lassie was truly relieved when Misty died, appeared to be distraught when Tulip died and devastated for months when her father died. What’s important to remember is that there is no “right” in how your dog responds. Accept it (ah, there’s that word again!) and go from there. You are always wise to consult a veterinarian if your dog seems listless for an extended period of time. It is possible that the change in behavior is correlated in time with the death of another, but not due to it. If there is not treatable medical or physical cause, you might consider adjunctive medicine if there is a well-trained practioner in your area. 6) LAST BUT NEVER LEAST: Take care of yourself as if you have just had surgery. Your brain thinks you have. See my post Love, Guilt & Putting Dogs Down for more information about how your brain processes pain and grief as similar things. Once I understood that fact (thanks to the brilliant neurobiologist Jaak Panskepp), I’ve learned to treat loss as if it was a serious injury–with gentleness, care, compassion, and the understanding that time is the best healer of all. Good advice for our dogs too, yes? And what do we do for people who have had surgery? We bring them food and flowers. Since I can’t deliver strawberry/blueberry pie to all 24,000 of you, here are some flowers. I think I’ve already posted this picture, but it made me happy to look at it. I hope it does you too. I’ve got no further insights, but I just wanted to say what a beautiful entry. I think you nailed it on every front. We knew that our dog didn’t have much longer in this world, as he had advanced cancer. He seemed to be happy and didn’t indicate he was in pain so he was able to die peacefully at our home. When he did, we brought him out into our main living area on his bed and invited the other dogs to sniff while explaining that he wouldn’t be able to play anymore. We gave them a good hour or so this way and I do believe they were able to process what was going on and accept it. Soon after, the other dogs started to ‘volunteer’ for the jobs he had performed for us. I think this was a very helpful process for our dogs but I do realize it isn’t always the same for all. I think if we would have had to have him euthanized, I would have brought the other dogs along so they could be there to understand that he was just taken somewhere in the car and didn’t come back. Great topic and insight as always! Love you’re work. Thank you for addressing this topic. I’ve not lost a pet while being a multiple pet home yet. However we have lost a family member that is affecting 2 of my Maltese. Last November we moved to a home where I could help care for my aging parents. I was unaware that my male Maltese was having vision problems. I noticed signs of something being ‘off’ and after testing found CaOx crystals that I believe were stress related. Still did not realize he was having vision problems at that time. So not only did he have to learn to navigate a new home while being visually impaired, but to get out of the way of older people who weren’t steady on their feet. Then in February my Dad unexpectedly passed away. It was during the week of the funeral and having many out of town family and friends stopping over in the evening when lighting was dim that we noticed a huge behavioral change. Not only was he acting depressed, he was fearful to the point he would scream himself hoarse around people he was not familiar with and strange dogs. Prior to that he loved every person and almost every dog. He started to be fearful of black dogs a few years ago. ( I have a store where new people and dogs come in routinely.) That was when we finally discovered he could not see in low light. The Ophthalmologist believes him to have PRA but his numbers were right on the line. So we see her again in November for a recheck. He does not see at all in scototopic lighting. She, along with my vet keep telling me there should be no behavioral change in a dog with PRA since it’s such a slow progressing disease. But your article leads me to believe that perhaps we are seeing such a huge behavioral change due to the other factors that happened as well as the grief at the loss of a beloved family member in conjunction with his diminishing sight. The first stranger he was actually happy to meet was an elderly man with a full head of white hair like my Dad had. That kind of sounds like grief…to me anyway. I would really love to read the article you mentioned about how grief affects the brain but the link is not working. Crystal: Thanks for letting me know the link to Love, Guilt and Putting Dogs Down wasn’t working. Now it is! And thank you for your story, it makes me happy and sad all at once. Kisses to your Maltese. Really timely entry for me. I had my 12 year old Standard Poodle put down just over a week ago, my somewhat grumpy Border Collie and our shih tzu cross both barked for two nights, which is abnormal behaviour for them both. I ended up moving their crates beside each other and we have had no further problems with either of them. I think that only a dog person would accept that they were grieving. In 2008, I lost my very elderly cat to cancer. At the time I also had an 11 year old Corgi. These two were inseparable – the cat had bathed, played with and slept with this dog everyday of the dog’s life. My Corgi was so upset, listless, not eating, not sleeping, not interested in my other Corgi or walks, nothing seemed to help. I took her to my vet who is a wonderful, caring man. He kept my Corgi overnight and ran a variety of tests. Her health was very good but she was seriously depressed. I stayed home from work to be with her and try to entice her to interact but in spite of our best efforts, she died within 48 hours from what was diagnosed as a stroke. I think the shock and grief of losing her best friend in the world was too much for her. “Fur absorbs tears better than tissues.” Grief shared is halved. Trisha, thank you for putting into words all the thoughts and feelings in my head and heart that I could not put into words. I will be hanging onto this like the gold it is. Almost from the moment I adopted an extremely bonded mother/son pair of cattle dogs three years ago, I began occasionally dreading the time when I would have to deal with one dog’s grief over the other’s loss. I’m very thankful to have this, for the future! Has anyone tried DAP or rescue remedy for grieving dogs? I’ve got two 13 year old dogs who have been together since they were 8 weeks old – I’m trying to prepare. Someone today gave me the link to your article, and I just want to thank you for writing it. I had to make the decision last week to let my beautiful black lab Cinder-Ella go. She had been diagnoised back at the end of May with Hodgkins Lymphoma. We were given 2 to 4 weeks left with her because of the advance stage of the disease.We ended up getting longer which was a blessing. My girl was the boss of our house. My Saint Bernard Duncan has had no problem letting her have the power. As the weeks went bythough we noticed the power shift. She started allowing him to take over. We tried to make each day special for them both and us…cherishing each day. I knew when it was time as I saw her get weaker and weaker. I really feel that she would have kept holding on for me, and I had to tell her that I would be okay…she could go on and be pain free.Last week most of the family went with me to say good-bye. I thought about bringing Duncan but didn’t…I wish I did. She woke up that morning and didn’t even had the strength to stand. Duncan was glued to her side.He remains a lot of the time in the spot where she last laid. He is not doing well. He is barely eating and barely reacting to all of us. He carries her toys and leash around and only sleeps in her bed. The vet had told me that yes he is mourning. Now with your article I am convinced. We are keeping a close eye on him and showering him with our love. Thanks Trisha. On another forum I frequently visit I’m talking to an owner of a cute 6 month old Malamute that they have to let go because of congenital deformities of hips and knees. She is in constant pain and surgery is not a realistic option. I just hope Incan help them a little bit, by sharing their grief and sharing the link to your assay on dog loss and grief. I can’ t help crying a bit and silly Spotty is coming to check on me. There are times to be so grateful for what you have. 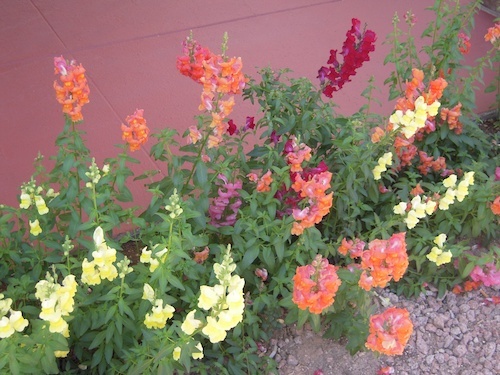 Beautiful snapdragons, though they brought me a shock and pang when I scrolled down and saw them. I am still grieving for my lost Papillon, named Cinnamon Snapdragon (or Dragon for short), who I last saw two months ago. Most of the time, the pain has ebbed away, but sometimes it comes crashing back through the classical conditioning you mentioned. I visited my parents recently, for the first time without a dog in four years, and I started sobbing the moment I saw their backyard, where Dragon had loved to lay in the grass and chew on sticks. thank you for writing this post. Thank you for making the point about time, being the only thing that would help heal, because you’re right. I’m going to read your article on emotional and physical pain as soon as I’m done commenting here. It was a beautiful post and I really appreciate it. I just read your article on love and guilt when putting a dog down, as well as the subsiquent comments. I just wanted to say, that I really needed to read that article today. My Marlin has been gone for three years now and today, well… I’m just missing him, my Bear. Wow, just had to swallow really hard. I’m at work and can’t cry in my cube. Anyhow, thank you so much Tricia, for writing that post. I still feel a twinge of guilt sometimes, why didn’t I notice the kidny failure earlier which retired him at 5, why didn’t I notice the symptoms of cancer which took him at 8? I know, I retired him for the right reasons, I gave him peace for the right reasons too, but sometimes, like today, it hurts so much that he isn’t here, my MarMar isn’t here and I want him to be here, it’s just as simple as that. I’ve found, that even though we say feeling guilty won’t help, we still feel it anyway and, at least for me, I just allow myself to feel it. Harkening back to the article, you said emotional stress and physical pain are perceived by the brain as the same thing and so I think it’s natural to allow the pain to run it’s course, kind of like being sick or hurt, just let yourself feel the pain and then let it fade away, so you can heal. I really hope no one thinks I’m advocating pathological guilt or wallowing in pain because I’m not. I’m only saying that, I think it helps to let yourself acknowledge the guilt/pain, so you can heal from it. Am I right? I don’t want to be giving bad advice and I’m not a psychologist or an animal behavorest, so if I’m wrong, let me know. but I just had to say thanks for writing that post, and for pointing me to it. Give all the pups hugs from me. I might just crawl under my cube and give the current yellow beast snoozing under there some Lovins, as my boyfriend calls them. I’d also like to emphasize the importance of thoroughly knowing yourself as well as your your dog when adding a new mate after a loss. I unfortunately know of a hyper, goofy adolescent dog who was brought in to a house not to be himself but to be a copy of the lost dog. Poor guy is referred to as the worst dog ever because the training methods that worked on the 6 dogs before him aren’t setting in. The owners seem to regard him as a lost cause, not having the energy, or inclination, to change how they handle him. He was brought home five days after an abrupt loss, and doing so has brought an awful amount of stress to the home… It’s just important to be flexible, prepared, and ever the optimist when dogs are involved, I guess. Though nose work is just a tangent here, I went to a class recently and saw it done by a certified instructor. Wow! Although it appeals to any dog regardless of physical ability, it doesn’t mean it can’t be amped up to suit a high energy dog. For those of us who don’t have experience hiding treats at the speed of light, having an extra person to distract the dog while another hides treats can help increase pace if a dog seems in need of a challenge. When done rapidly, the sport surprisingly reminded me of freestyle or agility. Fun to watch or play for everyone. Many thanks for great posts and discussions. To liz: It’s hard to imagine you ever sounding ‘goofy,’ except in some delightful way. I think your point is extremely important. First, know thyself. Not always so easy to do, but oh so important. I just read your post about guilt and euthanasia. I wish there were a better way, some combo of drugs we could give ourselves to our pets. I don’t know of anyone around here who does in-home euthanasia. My sweet cat Alice was nearly 17 when she got cancer, right before Christmas. One day she was fine and the next she had a huge lump near her hip. When I palpated the lump and it was firmly attached I feared the worst, and the needle biopsy the next day proved my fears correct. The vet said surgery was an option, but Alice was a timid soul and the thought that she might not come out of surgery and her last conscious moments would be alone and terrified in a vet’s prep cage were too much for me. I decided to try a long-shot short course of chemo, after researching and finding cats usually tolerate chemo very well. Alice didn’t. She had her shot, came home, and curled up on a chest and would not move. She would not look at food even though she ate the day before. When she finally DID move I realized she had some sort of neuropathy or ataxia from the drugs; she staggered when she walked. A call to the vet confirmed it’s a possible side-effect, but rare in cats; they speculated that even though her blood test showed normal kidney function, she had lost enough function just due to age that she did not clear the drug and ended up with an effectively higher dose. She wouldn’t eat or drink and didn’t want to move. She stopped purring and she stopped curling up by us at bedtime. I’d microwave cat food and she’d lap the liquid and that was it. I tried baby food, I tried Nutri-Cal. On what would be her last night, she ate a few crumbs of home made pumpkin bread, which had always been her favorite treat. It was cold, January, and I went out with the dogs and looked up and due to some atmospheric illusion, it appeared for all the world that a cloud passed BEHIND the moon and even though I’m not a superstitious person, I felt that Alice had sent me a sign. She had a vet appointment scheduled for the next day and I had some unrealistic hope that they’d give her some sub-q fluids again and it would make her feel better. I kept holding onto the idea that once the chemo drug cleared here system she’d feel better, since clearly her sudden downturn was because of the drug. That night she went to hop off the bed, fell over on the floor and did not want to get up. I took her to her appointment and the vet gently suggested that there was little point in going on with the fight. All my poor cat wanted was to get back in her carrier so she could go home. Sadly, the vet put her gently on the ground to watch her gait and she found the carrier and got back in and we actually had to haul her back out. I knew it was time, but after I wasn’t sure if I felt worse for trying the chemo which made her so miserable, or for not at least trying the fluids and another shot of steroids (she’d already had two and both perked her up) to get her over the chemo hump. Either way she would have only had at most a few more weeks, but it did take me some time to stop obsessing about two roads not taken. I had made the best decision I could with the information I had at the time; I hated to do nothing because she was a sprightly 17 with no other problems (good teeth, good kidneys, still hopping on and off the bed, good appetite) before the cancer. Given the same set of circumstances I would have done exactly the same thing again. However, my decision worked out badly and so I second-guessed it. As you point out, the hardest thing to admit is that we don’t have control and sometimes things just go wrong. My parents had an old cat that curled up and went peacefully to sleep and a few days later he was gone. That’s the end I wanted for my Alice, but that choice is not ours to make. Hello Liz, very well put. What helped me was when my brother said ‘You are grieving but you are not your grief” At the beginning I was overwhelmed, felt flushed away in waves of grieve. Then I visualised myself being touched by waves instead of swept away. I felt more in control and therefore more able to accept the loss and the grief. Does this make sense? And I feel sorry for the goofy adolescent and his owners. It can be such fun to discover how different dogs are. Even now, with two littermates, it amazes me how they vary even in learning processes. Anecdote: I still had Chenak’s old collar, when we put it on one of the young dogs because his collar needed to be cleaned, we warned him that only very special dogs could presume to be able to step in his footsteps. Jokingly, but there was some truth in it. By saying it out loud, we realised how unfair it would be 😉 Off course he now has his own collar again. Thank you so much, Patricia. This is a just beautiful post. It’s not often that when advice is given there are no platitudes whatsoever, just straightforward insights with so much gentleness. And also thank you so much to all the people responding in such a thoughtful and honest way. This is the only blog where I regularly end up reading all the responses to posts. I love the paragraph about acknowledging what happened by talking to your dog about it. Sure, they don’t understand the words we are saying, but I do wonder what other signals and messages we are sending out when we are putting things into words for them and to them … so often dogs seem to totally understand us. In a different context, but for example, just on the last weekend I was on my first ever agility competition. I was sitting in a little group of fellow club members. One of us went on her run with her dog, a novice course. The dog balked at the tunnel, at the weaves, at the tunnel again and disqualified. She came back to us and said to the woman next to me: “Nera needs you to have that tunnel talk with her again, please, before we have our next run.” The woman turned to Nera, took her face in her hands, giving Nera’s ears a good squeeze, and said: “Now remember, as I told you before, there are no monsters in the tunnels, and the weaves are fun, fun, fun.” I just looked, a bit dumbfounded about what was going on. Nera’s owner must have seen my expression and said that Nera sometimes gets worried about tricky courses, but that everytime Lorraine gives her a prep talk it really seems to help. And what do you know, Nera goes off and has a clear round on her next run. And thank you for the flowers. Snapdragons. Your picture hit me like a rock in that classical conditioning way. I used to plant snapdragons on my sister’s grave; we used to love their colours, and opening their little mouths together as children and see whether there were insects inside. I now live in a different country, but I still plant snapdragons in the garden on her birthdays. And looking at snapdragons still makes me happy. No, I’m not shaking my head. I’m nodding. I agree with all of it, and this is a beautiful post. Thank-you for sharing! We recently had a cat succumb to cancer. I had her euthanized in the house because she was in a lot of pain. Our dog examined her body once and then was done with it, but one of the other cats in the house became, and remains, extremely upset. Even though these two cats had never been close, and usually just hissed, growled and batted at each other, I think they were companions during the long days when we’re out at work and school. I never knew how much they meant to each other until one was gone. While the oldr cat lay on the couch, waiting for the vet to come, the other cat (a large, long-haired orange tabby) lay beside her, the closest I’ve ever seen him get to her except in fights. He was right there during the euthanasia, but once she was gone he hid in his cat tree, his back to the world, for the next 24 hours. When he emerged he was demanding, following us around, crying, climbing on us in a way that he never had before. Now, a month later, he still seems lonely. He sits at the door and cries for us. He is constantly underfoot in a way he never was before. He’s an indoor cat, and I’ve been struggling with what you’ve described – how do I change things up for him, help his life to move on? New toys, new treats… I thoroughly cleaned the house to try to get rid of the deceased cat’s smell, fur, bed and toys. So again, thank-you for your post. Greetings Mireille, I enjoyed the story of the old collar. Funny to imagine, from the young one’s perspective, being given such ‘responsibility’ as a type of rite of passage. Uplifting that you didn’t hold him to it, and that his own collar was returned. May we all be able to enjoy the beautiful diversity of dogs’ personalities. Thank goodness for supportive brothers. His comment seems to have nudged you to take a step back and get a new perspective, and that makes great sense. Good thinking! I know this series of posts has been about helping your dog (or cat) with the grief of losing another in the household but since there have also been comments about how we as humans manage our grief I wanted to recommend the new book out by Jon Katz titled “Going Home”. I just read it last night. Its for people who are grieving the loss, or immenint loss, of a dog or cat, its powerful and beautifully written – he has greatly evolved as a writer and it discusses so many important issues – grief, guilt, how to help kids w/loss, etc. And I am adding these blog posts to my binder of valuable resources as it speaks to so many important issues. Thank you! Wow. Such a great post, and such great comments. We had a female rat terrier Nikki and one of her pups, Columbus a male. My mom had another pup Nina and we saw them everyday. We also added another female Darcy to the family. Nikki died in February 2004 at the age of 15. We missed her terribly, but Darcy bonded with Columbus and just stayed a “puppy” letting him be the responsible one. She would’ve been about 6 then I guess. Darcy was a totally different dog. It was like the weight of the world was on her shoulders. There was no joy in her. It was like she felt it was her responsibility to take care of the house and us, where before she was carefree. We got another pup in October of that year, and while she wasn’t overly playful with her, she did start enjoying life again. I want to add that everyone’s comments have been so meaningful, I have just nodded my head at every one. Another comment, I just finished reading a book called A Dog Named Slugger about a service dog and the author commented how when the retired Slugger was ill, her current service dog seemed to help me. As he with poor eyesight couldn’t find the ball, the younger dog would bring it closer to him so he could find it. Thank you, Patricia, and also all the other posters for your thoughts and comments. How is Cin and Sleeves? Are they doing better? Thank you for this gracious and life-giving post. I was wondering why my dogs will not lie down on the bed or their very recently deceased companion. Any trace of Eddie on blankets, beds, even food bowls, causes the other dogs to avoid these items. Why? After I washed everything, they returned to normal. Do you know what they are thinking? Thank you for the insight. We had three dogs. A sheep dog, Roxy, and two Great Danes. One of the Danes is new to our home as of December 2014, Goober. I did this on purpose because our other Dane, Pepper, was ancient. Pepper and Roxy lived together for 5 years. Pepper was adopted when she was 4 1/2 years old. Pepper died last Tuesday ): We are very sad and her presence is greatly missed and felt. Unfortunately my “plan” of having Goober there to help Roxy with this transition has not been as effective as I had hoped. Roxy is very sad. We are trying to keep her busy and active. I feel better knowing she is not alone all day but some of her habits have changed including sleeping in places she never slept before but Pepper did. It breaks my heart. I only hope in time she will be able to remember her sister with love not sadness. I don’t think its silly to talk to my dogs so I will be having the conversation with her that Pepper died and we miss her very much. She will always have a huge place in our hearts. Our Lydia the Schnauzer passed away in the emergency hospital last Sunday, Sept. 20, 2015. She suddenly developed thrombocytosis and in spite of the best help available she kept going downhill. My daughter and I held her while she was helped to Rainbows and out of pain. She was a rescue and had been with us for five lovely years and was a sweet friend of our older Barney the Schnauzer. 🙂 Barney is definitely grieving. Why some people don’t think that happens is beyond me. He mopes, doesn’t want to eat much, but loves to go out and take long walks. In fact, he wants to be out of the house all the time. I have sat down and talked to him about what happened, and told him Lids is okay, she is in Heaven and she is all right. He listens intently when I say her name. I don’t want him to think I just forgot to let her in, or carelessly left her somewhere. I want him to know she is not forgotten and she is ok. Animals have animal souls and are smarter and more sensitive than a lot of people give them credit for. It has been three weeks and I am still crying. What’s getting me is that my husband took my best friend to the emergency vet and my baby was put to sleep all alone. I feel like he did everything for me and then I was not strong enough to be there for him. My other dog was definitely the follower. She’s very lost and sad. She’s getting extra walks, lots of love and brushing. My question is: am I making her grief worse? I had an older dog named jasper he was 1/2 golden retriever and 1/2 yellow lab. We then got 2 puppies. I had in the back yard a “Y” shape leash it allowed 2 dogs to go out at one time. Jasper and one or the other of the puppies would go out. When Jasper began to have bad eyesight . He needed help . He could not find the back porch if wind were blowing. So which ever puppy was with Jasper would grab hold of Jasper by the side of Jaspers neck. Then let go . Jasper would follow the puppy to the back porch to go inside. The puppies were brothers 1/2 black lab and 1/2 Aussie cattle dog. I now have one of the puppies he is 10 his name is king. Kings brother Sur died recently of heart murmur . For our family the way I grew up only one dog is sad. I mean dogs like to live in a group. I am fostering two teacup poodles who recently lost their human mom and a canine sibling. They are SO SAD…..what can I do to help them ? So sorry Christie. But its the same for dogs as it is for people…just give it time, and be patient. After a few weeks try teaching your dog some new tricks, doing things that are new that you never did with the dog who has passed away. Best of luck. It has been 2 weeks since we brought Lucas to the Emergency Hospital thinking he was just feeling under the weather from something he ate, etc. When the vet told us he was bleeding internally from a ruptured tumor we were shocked. They euthanized Luke and when we came home without him, our other dog Molly was looking for him. She still is looking for him when she goes out into the yard. She is definitely sad. We have started taking her for longer walks in places she’s never been. We take her with us to the store, etc. She seems happy with that. But she sits in front of the door if she thinks you are leaving her alone. She is becoming very clingy. How do you deal with that? My husband is retired so he’s home all day, but we eventually will need to leave her alone for more than the hour or so we are doing now. Thank you for this article. My housemate and I both brought dogs into our home and recently hers passed away. It’s a bit graphic what happened so please be aware. He freaked out during an unexpected storm and climbed our balcony grate and jumped 5 storeys. To my great relief my dog didn’t follow him but saw him jump and also watched him for about 40 mins lay on the ground below while my housemate and I made our way home. They were very attached to each other, her love for him perhaps a little greater than his for her. When we brought him inside so we could clean him up, we allowed her to be with him so she could see what had happened. We felt that as a dog with anxiety she needed to know that Maxi had passed. There was a lot of blood and she was trying to lick it up and after a while she started trying to raise him from his sleep like state. When the cremation company came to take him away she freaked out and tried to stop the man from taking Maxi with him, pawing at the box he was in and crying frantically. It has been 4 weeks now and she still seems a bit lost, we have tried keeping her routine the same, adding things in, taking away anything that may trigger her. This article has made me realise that her behaviours are normal for what has happened to her and to make sure she has what she needs from us. I have 2 great Danes one female and one male and i also have a small male dog that is the size of a winner dog. Couple of days ago the female attacked the small dog over dominance and punctured his lungs and killed him instantly. The female dabe now grieves and crys and circles the area it happened. The male dane was rushed to the laundry room to get out of the way diring the attack. After i got home from the vet of taking my now dead dog in the male dog smelt his blood that was all over my clothes. He instantly gave me a different look and has been acting out around me since with constantly being skiddish and growling and charging. Never had this problem before. Any reason why hes doing this? I have 2 great Danes one female and one male and i also have a small male dog that is the size of a winner dog. Couple of days ago the female attacked the small dog over dominance and punctured his lungs and killed him instantly. The female dane now grieves and crys and circles the area it happened. The male dane was rushed to the laundry room to get out of the way during the attack. After i got home from the vet of taking my now dead dog in, the male dog smelt his blood that was all over my clothes. He instantly gave me a different look and has been acting out around me since with constantly being skiddish and growling and charging. Never had this problem before. Any reason why hes doing this? My little Maltese, Bailey , age 12, today suddenly died after testing for fluid retention and heart failure. Initial diagnosis was heart failure, but vet found he also had cancer. Our poodle was a constant companion of Bailey’s. I am very thankful for all of the comments I’ve read in this column, to best know how to help Coco through this. God help us all to get through this loss. We were fortunate to have a vet come to our house to put our 12.5 year old lab to sleep 10 days ago. We have a rescued 8 yr old dachshund that has been with us 3 years. Although the dogs never played or interacted, they were together all the time. Our dachshund left the room as the lab drifted from life, and since is totalky lethargic, is eating ok but no personality or interest in anything. I had just had tons of blood workup on her 3 weeks ago so believe its not a health issue, but I m at a loss as to what to do for her. She use to follow me everywhere but now could care less where I am. Doesn’t want to go out, doesn’t want want treats. I recently lost my beautiful golden Charlie who was without a doubt my “soulmate dog”. I was fortunate enough to have our vet come to our home where we gave Chuck his goodbye celebration feast of 2 hamburgers, 2 tacos, a large french fry, a cupcake and died eating his favorite ice cream. We took him to his favorite spot on top of the stairs looking out to the pool where he would spend hours every morning. We let our other dogs, also goldens be a part of this event so that they would know what happened. We then were able to bury him under his favorite redwood tree in a make-shift coffin with his favorite toys and of course momentums from me. It was SO HARD. I am still crying every day like a baby. Anyway, it has been over 2 weeks and our youngest puppy golden, Brie goes outside every evening and just sits right beside where Charlie passed for sometimes an hour. She has such a long sad face and stares and sniffs into space as if she is talking with him or trying to find him. I go and sit with her and just talk about Charlie and try to explain that his is a great place, able to walk again and with lots of other fun dogs to play with. So I came onto this site to see what others say about grieving animals. It breaks my heart and we are both so sad together. Reading this confirms my thoughts are real and that just to be with her and talk to her is the best thing. I think she also knows my grief is huge and could be feeling what I am hurting about. Thank you for having this blog that allows me to express this. Warmest regards to everyone who hurts for the loss of their animals and for the companion pets who moarn, too. First Lorrie, I am so sorry. It’s so hard to lose a dog in is own right, much less watch another dog suffer. Sounds like it’s been about a month since Sasha died. I’d consider a visit from a holistic vet. All kinds of things might help, from acupuncture to herbs to pheromones. If that doesn’t help, I think medication on a temporary basis could be a kindness. I’d make an appt by phone with a veterinary behaviorist to be sure you are using the right medicine. thank you to everyone posting here. we helped our golden, zeke (12) cross the bridge on wednesday. as a hospice volunteer, i’ve been trained in grief work… the signs in my surviving yellow lab (cyrus, 10) are so familiar to the humans i’ve worked with over the years. Our old dog died 3 days ago. Due to her having SA, we have had Dogsitters and she and her brother have never been alone. We want to be able to leave him without sitters. He is very calm and has never had any issues with SA. He does follow me the the door but seems okay. I’m just nervous about leaving him now. Any ideas to make sure he is okay? Thank you for the post it has helped me a lot. My beloved blind diabetic Labrador, Max died last week aged 14 and my little terrier Ben is broken hearted as I am. Ben and I were never close and Max was the glue in our little family of 3. We both adored him. I have learned at least I am not mistaken about Ben’s grief and will try to be extra gentle with him. Sadly he too is ill and I fear I may lose him too in his sorrow if he does not turn to me. Thanks for all this beautiful article I’m heart broken I just had to put to sleep my little one , I really was not expecting to do it that fast but he was suffering a lot ! The sad part ( beside to lost my little one ) is that I took him to the vet and he told me that the cancer was so bad and the tumor to big and the best thing to do is to put him to sleep right away I started crying and agreed so he is gonna to heaven , as I was saying , the worst part is to come home without him , my other dog was waiting for both of us , since his friend did not come back , omg! He is crying really crying ! I don’t know what to do to aliviarte his pain , I’m not in mood to get him company , because I passed already for this process, actually I adopt the little one that just passed away because he was suffering from other loss his partner die and he got depressed so I opt to getting a company for him , all of us was so happy for 6 years until the little one get so sick 3 months ago , I was pretty sure he would be ok , I never was expecting that he would get cancer – I’m really totally desvasted and my dog too , he couldn’t say good bye to his friend and I’m feeling so guilty for that …. Dogs definitely do grieve. My dog Bear was distraught when we had to put his father Ceasar to sleep as he was the only family he had left. Backstory: Ceasar aka Boofhead was a 60-65kg Rottweiler who was mine and my family’s family pet, he was the most loyal, gentle, lovable, gassy (Later I would learn that Rottweilers actually have a reputation for having nuclear farts) fuzzy who was very protective of both my family as his human family and later with his mate or as we called her- his wife Tessa and their actual furbabies (They had 2 Litters, Bear was from the first litter). When Bear’s brothers and sisters were given to their families and it was just him and his parents they became a solid family unit. I would go outside and Bear would be at the back of the kennel, than Tessa than Ceasar laying out the front to protect them, or they’d lay in front of the screendoor with Bear between Tessa and Ceasar. Not long after unfortunately when Bear was about 6-7 months old my dad forced us to get rid of Tessa because he’d had enough of her (I’m still angered by that to this day because she was such an intelligent, gentle dog who the rest of my family loved and deserved to go surrounded by family) and my mum said that Tessa just sat in the car, expressionless, looking straight ahead like she had blinders on and my mum swears Tessa knew something was up because when they arrived and Tessa was checked over they said she had bad breast cancer and had to be laid to rest. This was something that at the time didn’t seem to bother Bear (I presume Cesar’s presence eased the pain or that Bear was too young to get it) but than when he was about 10-11months Ceasar got vicious Osteosarcoma and in three weeks was riddled with tumours along his spine and various other areas, Bear this time ‘round had to watch Ceasar slowly become paralysed, lose control of his bladder and eventually saw him carried into a car from his kennel and never see him again. As soon as we got home and Bear saw no sign of his father he began whimpering, no barking or howling just whimpers, the way we helped him cope was bringing him inside daily, giving him cereal, watching cartoons etc. He’s healed now (7 years down the track) but to this day he’ll never go near that kennel, we thought Abe it was haunted by Ceasar because other dogs aside from a puppy we had wouldn’t touch it either. But a vet said for Bear it was trauma related and for other dogs apparently they could sense who had been there befriend them and knew that the kennel had belonged to another dog. I love the article and all the comments. Question for the group, how long did it take your dog to get back to normal life? I just lost my beautiful 13 year old Sheltie and am wondering when my other dog will feel better.